This is an old post from my first blog, House-Wise, published originally back in 2010. Make Your Own Air Fresheners. A Craft. Making your own products not only saves you money, but you can control the ingredients you use. Don’t want certain chemicals in your house? No problem! Have allergies? You can easily substitute. Like certain fragrances or colors? Perfect. Making your own products solves these kinds of issues. Here are two crafts that you can make for yourself, or, you can make a few for holiday gifts this year for family and friends. Make any room in the house smell fresh for the holidays or any time of year. Take a small, clean glass jar with a lid, and put a few cotton balls inside. Add a few drops of your favorite essential oil, such as eucalyptus, peppermint, cinnamon, orange or clove oil. 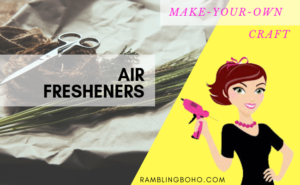 Punch holes in the top of the jar and place jar under a bed, in a closet, near a cat litter box or any other place that needs a fragrant addition. You can decorate the jars by painting the lids with craft paints or nail polish, add some glitter, etc. This is a nice project for young children who can then give them as gifts to grandparents or teachers. In a small pot, mix 1 cup water, essential oil and food coloring. As soon as it starts to boil, remove from heat. Completely dissolve gelatin and salt in the hot water then add the other cup of water (cold)–stir well (gently so it doesn’t foam). Pour into jars and set aside for a couple days before using so the gelatin has a chance to completely set (you can refrigerate to speed up the process). Once cooled, cover with lids that have a few holes punched in them to allow fragrance to escape. Make sure the jars are completely clean before pouring in the hot liquid. You could cover the top with lace or netting instead of jar lids. Tie decoratively with ribbons, raffia, whatever you fancy. Any heat proof glass jar will do. Collect jam & jelly jars, mason jars or even baby food jars can be used for the Smelly Jellies. Here is a little something, that’s cute by far. It’s a liquid when poured into a jar. It’s not to be eaten. It’s not for your belly. It’s to freshen your room.